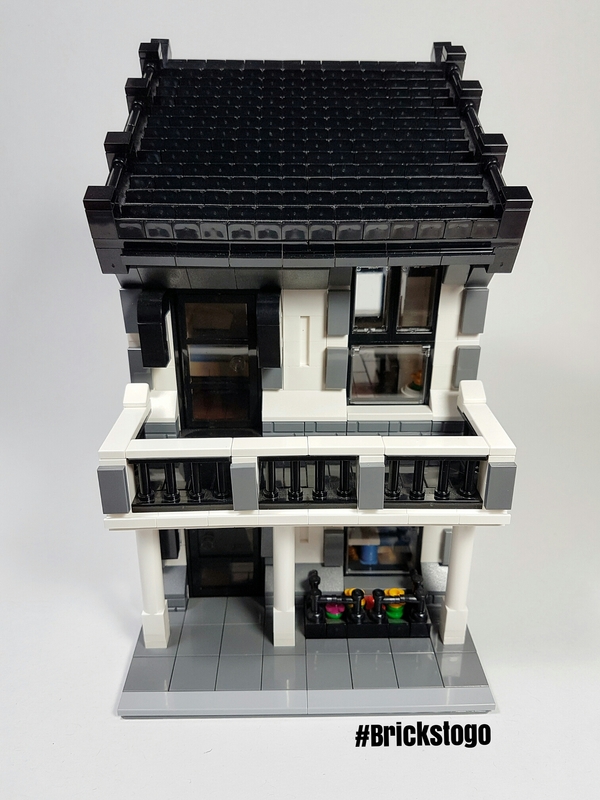 This next modular building is not an apartment with different rooms, but a single house with a large bedroom, a kitchen/dining room, and a small lounge area. 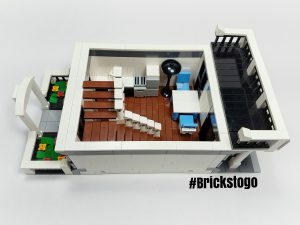 Yes, it’s missing a bathroom, but this is Lego and not real architecture so I think I can get away with it. As I mention in the video, I usually try to focus my attention mainly on the exterior of my builds; building the exterior first, then working on the interior. So whatever space I have left on the inside decides how much I can add to the interior. I realize only after however, that I need to work on adding more colour to the build. I love the way it looks, and I wouldn’t change this build in particular, but my next ones definitely need something more to catch the eye. Otherwise my city will be very bland and dull, and I’d like it to be bright and colourful. Adding interiors is a lot of fun and takes quite a lot of thought as to how you can maximize the layout and fit as much detail in as possible. Designing small furniture and interior decorations can be quite entertaining as you tinker away with different small parts to get the look you want. Frustrations can also arise however, when you realize the space is simply too small for your design and you have to start over. Usually I will leave that part of the project and come back to it with a fresh mind later on. This helps tremendously, and often I find a solution to my problem quite soon after re-tackling the problem again afterwards. If you are ever stuck in a build and aren’t quite sure what the next step is, take a break and come back to it later. You might even think of a solution while you’re at work the next day, it’s happened to me and could happen to you. The worst thing you can do is get so frustrated with a build that you give up entirely. Finishing the hard builds are the ones that give you the most satisfaction!